Brief: A short drama to complement a sermon on the topic of the Second Coming, focusing on the anticipation of seeing Jesus in the clouds. This drama is intended to be serious and somewhat emotional (happy). Que: Towards the end of the sermon the topic changes to something like "we don't know specifically when Jesus will return, but we are told it will be soon" or "we always need to be ready, at every moment"
Scott Wegener on things that go more than bump in the night. The sound of an espresso machine frothing milk, “Pssshhhhhhgshgshgshgshgsh”, and a two-stroke lawn mower idling, “putt-putt-putt-putt-putt”, are intermingled with the deep airy sound of a T-rex trying to blow out candles that never extinguish, “kerrrrrrrrrr – khoooooooo”. This best describes the concoction of sounds in the small echoy dormitory room I was trying to sleep in. Scott Wegener holds the copyright to this piece, along with everything else on www.ScottPublished.com , but he may well let you use it elsewhere, just ask! This was written by Scott Wegener to accommodate a specific brief. If you want something written specifically for your needs, just ask for a quote! 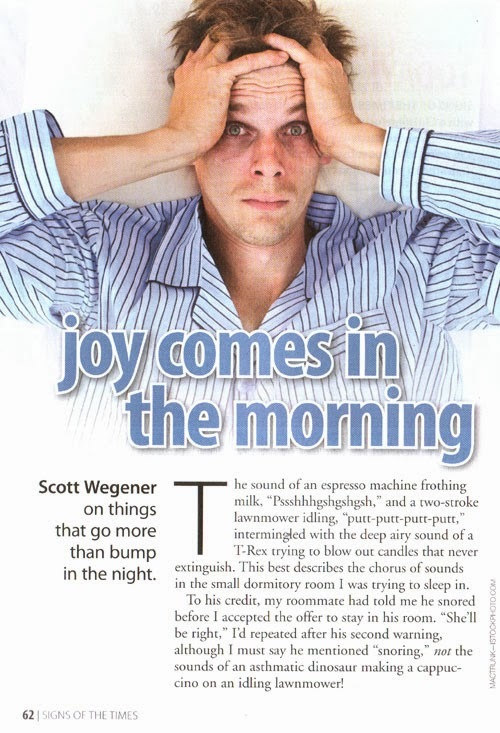 Scott Wegener is a multi award-winning creative writer who encourages everyone to ‘Be joyful always!’ Scott also loves geocaching, Theme Parks, boomeranging and playing his Morrison Digital Trumpet. All works are copyright Scott Wegener. Theme images by andynwt. Powered by Blogger.